Scalable, user-configurable 8-channel PPM/loudness touchscreen meter. The core stereo applications may be expanded with a number of optional metering plug-ins that include surround sound analysis for 5.1, 6.1 and DD+ 7.1 (the RTW “House”), TC Electronics LM5D Radar display, EBU R128-compliant Loudness Range (LRA) display, moving-coil meter simulation and extensive control functions. Available in desktop and OEM-installation options. Also available: the 16-channel RTW TM9 provides the same metering and analyser options, but has a larger screen and can accept a wider range of I/O formats. 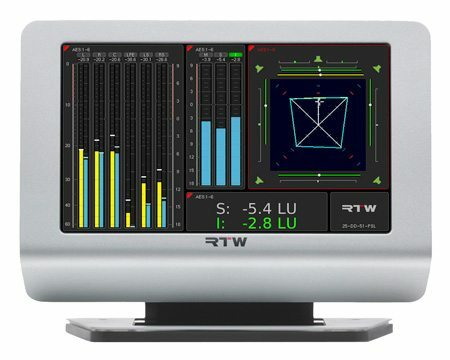 The TM7 is one of the RTW range of audio metering and analysis displays based on touchscreen technology. It is intended for monitoring of stereo and surround sound programme material in a professional broadcast, production or recording environment. It provides the user with all the information necessary to achieve accurate sound level and loudness management when working in stereo or surround (5.1, 6.1 or 7.1) formats. The 7” 16:9 touchscreen is available as either a free-standing desktop display, or a bare chassis version for mounting in custom equipment or furniture. The unit’s functionality – i.e., the set of measurement “instruments” it provides – is defined by the customer to match his/her needs. Apart from the basic stereo capability, all instruments are in the form of optional individual software modules, and those required may either be specified at the time of order, or added at a later date to address new operational requirements. The standard unit provides a stereo PPM with both analogue scaling (DIN +5, Nordic, or British IIa/IIb) and digital scaling (-60 dB to 0 dB/-60 dB to + 3 dB TruePeak, quasi-DIN, quasi-Nordic or quasi-British IIa/IIb) with Peak Hold, phase correlation metering, and a vectorscope display for stereo programme material. These functions can be expanded in a variety of ways with software modules: PPM metering of up to 8 channels; SurroundSound Analysis (the renowned RTW “House”); ITU/EBU Loudness measurement of up to 8 channels (LU or LUFS units); Loudness/SPL measurement – including a Loudness Range (LRA) display compliant with EBU R128, Real Time spectrum analysis; AES Status monitoring, emulation of RTW classic gas plasma displays and of moving coil meters such as single- and dual-coil PPMs, and VU meters. A unique feature of the TM range is the availability of the TC Electronics LMD5 Loudness Radar Meter as a further software module. The LM5D is a multi-function audio analysis instrument which shows both instantaneous loudness and loudness history in a user-friendly circular sweep display (akin to a radar screen). True-peak level measurement is compliant with the ITU-R BS1770 standard and the recommendations of EBU R128 and ATSC A/85. Another particularly useful software option is a BLITS generator/analyser module. The module generates both the BLITS 5.1 tone sequence, and stereo ident tones in either GLITS or EBU 3304 formats, and makes them available at the AES3 outputs with a station ID header, if required. The analyser section displays signal level as a numeric value, channel allocation, phase error, delay and polarity (normal/inverted) of a BLITS signal on any of the digital inputs. The TM7’s full colour screen layout is entirely definable by the user; each instrument’s display is a window which may be made active, sized and positioned at will. All instrument controls are accessed by touching the screen; or if preferred, a mouse may be used. A VGA output is provided to allow the screen image to be displayed on a larger external monitor. A GPIO port is included to permit external selection of unit configurations, and an Ethernet/LAN port to allow additional software modules to be installed. The TM7 is designed to interface directly with analogue equipment as well as today’s all-digital broadcast infrastructures. It comes with eight balanced analogue and four balanced AES3 digital inputs. The digital inputs each have loopthrough outputs for the connection of downstream equipment. The unit may be specified with the digital I/O on either multiple BNC sockets or a 25-pin Dsub connector.